In Ottawa, meeting rooms for rent can be a viable option for medium- to large-sized businesses that hold a great deal of important conferences. 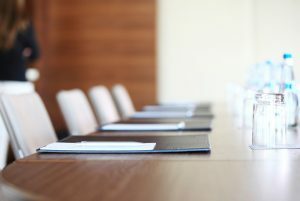 However, it can be difficult for some supervisors or company heads to determine exactly what constitutes an important enough topic to warrant holding a physical meeting instead of a virtual one. That depends on a few things: the requirements of your company, the convenience factor for your employees, the urgency of the content. Before scheduling a meeting and renting a meeting space in Ottawa, take the time to weigh the pros and cons of holding a virtual meeting versus a physical meeting in a meeting room. Here are some of the disadvantages and advantages of virtual meetings versus face-to-face meetings in a meeting room. Employees can work from the comfort of their homes, they do not have to commute, and out-of-town employees do not have to travel nationally or internationally on the company’s dime. This saves the company time and money, and it reduces its carbon footprint. You can interact with employees from any location without having to designate a single meeting spot, which is convenient for everyone. Employees can easily telecommunicate or electronically communicate with one another. Technology is not always reliable and can sometimes break down, which delays the entire meeting and wastes everybody’s time. Teleconferences can be difficult to conduct with larger groups as people can constantly interrupt one other and it can be difficult to tell when someone is finished speaking. On that note, it can also be difficult to determine who is speaking at any given time without voice recognition. Not everyone has the same level of technological savvy; therefore, some people might have difficulty operating the equipment or getting online. Virtual meetings often lack sufficient physical contact, which means there are a lot of physical cues or social cues that could be missed, especially if the equipment lags. Slow connections could cause the videos to lag. Risk of using unsecured networks, which could breach confidentiality and cause sensitive information about the company to be leaked on the Internet. Face-to-interactions with fellow employees, managers, CEOs, etc. can help to improve employee morale. You can ensure that there are no distractions during the meeting (i.e. cellphones, tablets, etc.) and that employees are paying full attention. You can encourage participation and allow your employees to visually pitch ideas, ask questions, and raise concerns. Physical meetings can usually accommodate larger groups of people where all employees can communicate more easily and keep track of who is speaking. Technological breakdowns will not necessarily hinder or stall the meeting unless the presentation is heavily dependent on technology. Employees will have to commute to the location of the meeting, which can be very inconvenient if they live far away or they might be late due to unforeseen traffic. If the meeting is very important, some employees might have to travel from out of town to participate. Ultimately, the decision to hold a virtual meeting versus renting a meeting room is highly situational and at the discretion of the person calling the meeting. However, if you want to appease all of your employees—the local and international ones—it might make sense to combine the two concepts of virtual and physical meetings. Have the local employees attend the meeting in person and then video-conference in the international employees as much as possible. Innovative Professional Offices is committed to helping your business succeed in every way possible. All of our services and rental plans—whether you are looking for a traditional office or a virtual rental office—are fully customizable to meet your requirements. We have a wide selection of affordable packages to accommodate your business. Contact us learn more about our meeting room rental options in Ottawa.